From the cradle to the grave humans are programmed to be inquisitive and ask questions. This, in the beginning, is to learn, to discover, and to be able to cope with the environment in preparation for growth, development, and indeed our survival. As time goes by, we then move towards more questions of reflections and more like what we have done and what could or should have happened, and whom may have helped. The responses to these questions and the findings depend on a number of fundamental steps. These are: (1) Asking the right questions at the right time, (2) ensuring quality of the information/data being collected, (3) having great “life-mentorship” and being an apprentice, (4) learning to collaborate and to network and (5) finally having the answer and then communicating the finding in our conclusion(s). Research therefore is part of the fabric of our life as humans and vital for our very existence and advancement. As society progressed and realized their potential as they invested in research and development, and with that came great economies. Nations whom are leading the global economies today were those who invested heavily in developing their R&D initially. Vital to these endeavors are universities, and in them, their research enterprise consisting of their faculty, their graduate programs, and the very students they are entrusted with. Therefore, our continuum of human development highly depends upon generating a stream of talented individuals, whom if followed the above steps, would end up as great thinkers, innovators, inventors, artists and scientists of this great world! Those institutions vested in ensuring the existence of such an environment; by recruiting great faculty, provision of appropriate infrastructure, and placing mentorship at the helm of their activities, shall indeed, contribute in their part, as our homes did during our early lives and got us to where we are today! Sehamuddin Galadari is currently the Senior Vice Provost of Research, Managing Director of the Research Institute, and Professor of Biology at New York University Abu Dhabi (NYUAD). Prior to joining NYUAD, during a career spanning more than 27 years, Prof. Sehamuddin was the Vice Provost for Research and Graduate Studies at UAE University, and before that Associate Dean for Research and Graduate Studies at the College of Medicine and Health Sciences (CMHS), UAE University. Prof. Sehamuddin obtained his PhD in Biochemistry in 1991 from Imperial College London, UK, and his BSc with honors in 1987 from University of Southampton, UK. He is a Fellow of the Royal Society of Biology (FRSB) and the Royal Society of Public Health (FRSPH) UK, and was elected as a Fellow of the Islamic World Academy of Sciences (FIAS) in 2016. Sehamuddin joined the CMHS at the UAE University as a faculty member in 1991 and helped in building the department of biochemistry, and he contributed significantly to the development of the CMHS in research and education. Prof. Sehamuddin serves on many prominent national and international boards and committees and has won many awards. His research interest revolves around apoptosis, autophagy, programmed cell death and cancer biology, and he has published over 60 manuscripts in international peer reviewed journals, and has supervised a number of PhD students and post-doctoral fellows. He has contributed significantly to biomedical research in the UAE. Prof. Sehamuddin has been a visiting professor to many well-known institutions such as Imperial College London (UK), Oxford University (UK), University of Glasgow (UK), Duke University Medical Centre (USA), Medical University of South Carolina (USA) and POSTECH (South Korea). He is a visiting professor at Harvard Medical School (USA). Prof. Sehamuddin is a reviewer and has served on the editorial board of a number of international biomedical journals. Dr. Mohammed Al-Mualla assumed the responsibilities of the Undersecretary for Academic Affairs of Higher Education at the UAE's Ministry of Education in November 2016. In this role, Dr. Al-Mualla provides leadership, strategic and executive direction for two sectors in higher education affairs: Planning & Development, and Accreditation & Academic Services. This includes the departments of: Scientific Research, Quality Assessment, Scholarships, Graduates and Labor Market, Registration and Counselling, Certificate Equivalency, Licensure and Accreditation, and Professional Licensing. Dr. Al-Mualla holds a PhD degree in Electrical and Electronics Engineering and an MSc degree in Communication Systems and Signal Processing both from the University of Bristol, U.K. He also holds a BEng degree in Communications Engineering from Etisalat College of Engineering (currently Khalifa University), UAE. Dr. Al-Mualla has an extensive academic and administrative experience of more than 17 years. He joined Etisalat College of Engineering in 2000 and then played a major role in the establishment of Khalifa University where he assumed several positions including Campus Manager, Interim Provost and the Senior Vice President for Research and Graduate Studies. In his last role he was responsible for providing leadership and strategic direction of research and graduate studies programs, the engagement of the university with industry, intellectual property management, technology transfer and research support services. In prior roles, he was also responsible for academic affairs, student recruitment and admission, student affairs and services, registration services, and academic support services such as libraries and laboratories. During his career, Dr. Al-Mualla has contributed also to teaching and research. He has taught a range of courses such as Signals & Systems, Digital Signal Processing, Audio & Image Processing, and Multimedia. His main research interests are in the area of multimedia processing and coding and multimedia digital rights management. He has published widely in refereed international journals and conferences and is the author of the book” Video Coding for Mobile Communications: Efficiency, Complexity and Error Resilience”, Academic Press. He supervised 10 Master and Doctorate students. He has contributed to curriculum and program development, and participated in, and led, many accreditation activities by both local and international bodies. He has been a member and chair of numerous University committees, boards, and panels. He has also led the development of many programs, most notably the Ph.D. in Engineering degree which is the first Ph.D. in Engineering degree to be accredited in the UAE. Dr. Al-Mualla is currently a member of the Board of Trustees of the ICT Fund, the Board of Trustees of the Abu Dhabi Vocational Education and Training Institute, and the Board of Trustees of the National Qualifications Authority. 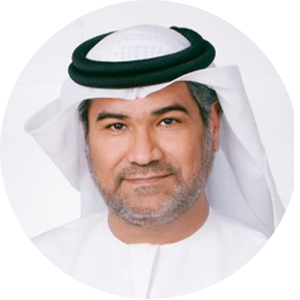 He is a member of the Senior Management Board of the Emirates Telecom Innovation Center (a partnership between Khalifa University, Etisalat and British Telecom) and chair of the Senior Management Board of the Mubadalah-KU Aerospace Innovation Center. He also served in the past on the Board of Directors of C4 Advanced Solutions and the Board of the Emirates Science Club. Dr. Al-Mualla is a Chartered Engineer (C.Eng. ), Member of the Institute of Engineering and Technology (IET), and Senior Member of the Institute of Electrical and Electronics Engineers (IEEE). 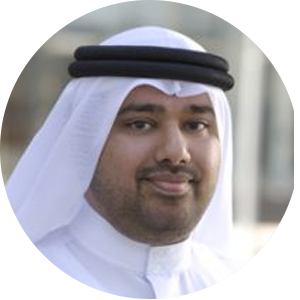 Dr. Al-Mualla was the Chairman of the IEEE UAE Section from 2014 to 2016. He also served as the Vice Chairman from 2006 to 2012. He founded the IEEE UAE Signal Processing & Communication Joint Chapter and served as its founding chair from 2004 until 2012. Dr. Al-Mualla has been a member of the steering, organizing and technical program committees of many international conferences, and has served on many editorial and reviewing boards of international journals and conferences.